We are a well stocked art supplies shop, specialising in spray-paint, graffiti art and street art products. With an impressive 450+ colours of spray paint in stock you won’t be stuck for choice! We also stock an array of other products such as pens and paint markers, inks & paints, acrylics, pencils, sketchbooks, primers & varnish sprays, safety & protection equipment, clothing, books, magazines, original artwork & prints, accessories, gift ideas and more from brands like; Montana Gold, Montana Black, Molotow, Posca, Kobra, Loop, Krink, 3M, Amsterdam, Derwent and Hektik Streetwear. We also offer student discount on spray paints! Please note: We do not currently sell spray paint online - please visit the store to purchase! Our gallery space showcases a range of visual artworks and styles by both local & national artists with international faces occasionally making an appearance. Drop in and browse some of the talent on show. We sometimes host exhibitions and events – keep an eye on our social media accounts for updates and information. Visit www.spectrumarts.co.uk for more details! 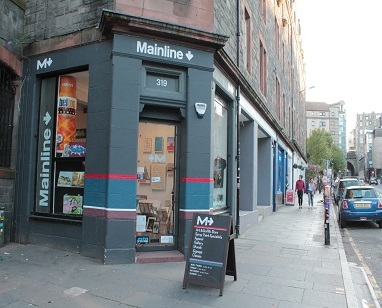 We are based in the heart of the city, just 5 minutes walk from Waverley train station & 10 minutes from the bus station.